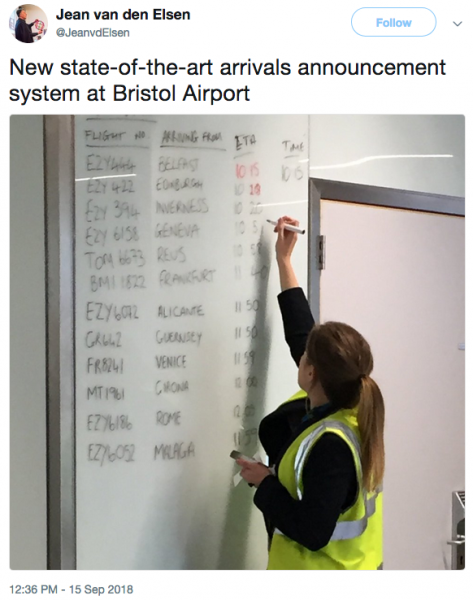 Bristol Airport in the United Kingdom was hit recently by a ransomware incident that caused disruption to flight information display systems, forcing staff to resort to whiteboards and markers. Bristol Airport, which according to Wikipedia is the ninth busiest airport in the UK by passenger traffic, informed travellers on Friday that it had been experiencing “technical problems” with its flight information screens. No flights were impacted, but the airport had to use alternative ways to help customers keep track of flights, including announcements made over the public address system and using markers to write down flight information on whiteboards and pieces of paper. The flight information screens were restored in key locations in the terminal by Sunday morning local time. Bristol Airport representatives said they did not believe it was a targeted attack. They noted that the flight information screens and other applications were taken offline as a precaution after the malware made its way onto some administrative systems. The airport said it did not pay any ransom, and claimed that it took longer to bring systems back online due to its “cautious approach.” Representatives said the incident did not impact or put at risk any safety or security systems. Ransomware causing disruptions at an airport is not unheard of. Last year, airports in Ukraine were hit in both the Bad Rabbit and NotPetya attacks, although NotPetya later turned out to be a wiper malware disguised as a piece of ransomware.